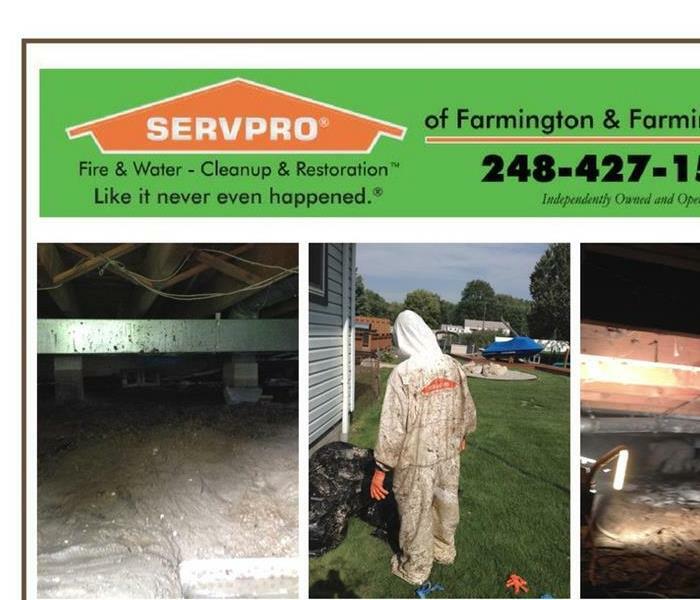 SERVPRO of Farmington & Farmington Hills is a trusted leader in the restoration industry, and our highly trained technicians provide 24-hour emergency service. Since 2003, we have helped countless home and business owners in the Metro Detroit community recover from disasters such as fires, water damages, mold, and more. We provide 24-hour emergency services and respond to any-sized disasters as quickly as possible. We’re dedicated to responding faster to any size disaster with the training, equipment, and experience to respond to your restoration or cleaning needs. Our SERVPRO of Farmington & Farmington Hills is unique in that it is locally owned and operated while also having the support of a large national chain. We live and work in this community too; we might even be neighbors. As a locally owned and operated business, SERVPRO of Farmington & Farmington Hills is close by and ready to respond to your cleaning or restoration needs. We are proud to be an active member of the Farmington Hills, MI community and want to do our part to make our community the best it can be. SERVPRO of Farmington & Farmington Hills proudly serves Farmington Hills, Northville, Farmington, and surrounding areas.